• AcuRite recommends NEW, HIGH QUALITY, NAME BRAND ALKALINE batteries for the best product performance. • In outdoor, low temperature conditions (below -4 degrees Fahrenheit / -20 degrees Celsius), AcuRite recommends NEW, HIGH QUALITY, NAME BRAND LITHIUM batteries for the best product performance. • Verify batteries are fresh. The battery expiration date should be at least 5 years in the future. Batteries can lose 3% of their power or more every year in storage. • Follow the polarity (+/-) diagram in the battery compartment. • DO NOT USE heavy duty, rechargeable or private label brand batteries. These batteries are not recommended due to fluctuations in the way these types of batteries disperse power. 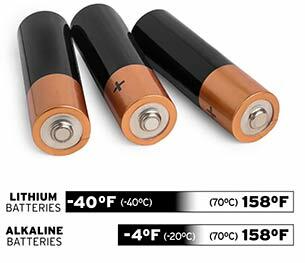 • DO NOT MIX old and new batteries or different types of batteries (brands, alkaline/lithium, etc.). • Clean the battery contacts and also those of the device prior to battery installation. • Remove batteries from products which are not to be used for an extended period of time. • Promptly remove dead batteries from the device. • Dispose of used batteries properly. • DO NOT incinerate used batteries. • DO NOT dispose of batteries in fire, as batteries may explode or leak. • DO NOT recharge non-rechargeable batteries. • DO NOT short-circuit the supply terminals.